There’s still another game remaining in the regular-season but its safe to assume how the top three teams in the West Bay Athletic League boys soccer race will finish. Sacred Heart Prep clinched at least a share of the title after beating host Harker, 3-0, on Monday. Menlo School clinched no worse than second after beating visiting Eastside Prep, 8-2, in combination with the Gators (16-0-2, 10-0-1) victory over the Eagles (13-4, 8-3). The Knights (15-2-2, 9-1-1) hold a four-point lead entering Wednesday’s 3:30 p.m. home match with Harker. All three teams will advance into the Central Coast Section tournament with divisions and opponents to be determined at Thursday’s closed seeding meeting. Sacred Heart Prep recorded its sixth consecutive shutout and ninth in 11 league matches. Only Menlo (once) and Harker (twice) scored against goalie Jacob Anderson and the Gators’ defense. SH Prep has outscored its WBAL opponents by a 42-3 margin and travels to play Crystal Springs Uplands at 3:45 p.m. Wednesday. The winless Gryphons have been outscored 54-11. Against Harker, Kyle Nilsson, Liam Johnson and Matthew Kirkham each scored to keep Sacred Heart Prep at the top of the class. The Gators’ lone smudge on their league record is a scoreless tie with Menlo. SHP and host Palma also played to a scoreless tie in December. It will likely get a little more difficult should the Gators be assigned to the Open Division. They did beat Sacred Heart Cathedral of the WCAL but the Irish will finish in the middle of the pack. Sty. Ignatius clinched the WCAL title heading into Tuesday’s finales. Bellarmine and St. Francis will also finish ahead of SHC. Menlo junior Aaron Morgan finished with a hat trick against Eastside Prep, with two of his goals coming in the first half. Seniors Connor Nelson and Ben Lasky each added a pair of goals and sophomore Tor Micaelian also scored. Senior Jony Ebrahimian recorded two assists and senior Max Colowick, juniors Trevor Perez, Nico Monsalve and Micaelian each added assists. In another WBAL match, Priory fell to host The King’s Academy, 2-1. The Panthers finished their season at 6-9, 5-7. Menlo-Atherton beat visiting Woodside on Monday, 2-0, and will place second in the league behind Burlingame, which already clinched the title. The Bears (10-6-3. 8-3-2) complete the regular season with a home game against Sequoia at 4:30 p.m. Wednesday. Axel Valle and Miguel Tostado each scored and Kalani Napoleon added an assist for M-A, which rallied around goalkeeper Charlie McKay to secure the shutout. Menlo School completed its league season undefeated, beating host Mercy Burlingame 3-0 at Skyline College on Monday. Menlo dethroned reigning West Bay Athletic League Foothill Division champion Notre Dame Belmont, which lost at Priory, 3-2, and placed second. Priory finishes third. All three earned automatic bids into the CCS tournament. Sacred Heart Prep, which beat visiting The King’s Academy 3-0, clinched the fourth spot and travels to WBAL Skyline champion Crystal Springs Uplands for a CCS play-in match at 3:30 p.m. Wednesday. 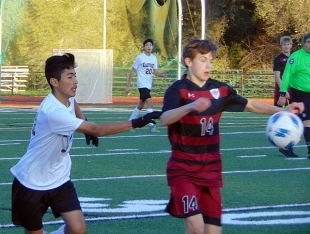 Both teams will likely find a spot in the tournament, as will Castilleja, a 2-1 winner over Harker, in the expanded CCS soccer brackets. The Knights (17-1-2, 8-0-2) could find themselves in the Open Division. That would be just fine for a team that is anchored by U.S. national U-17 member Sophie Jones, who is enjoying her senior season playing for her school. Jones scored one of the goals, along with Catie Cassini and Stella El-Fishawy, who got Menlo on the board in the 15th minute with a dazzling shot into the far corner. Cassini, a big factor in keeping Mercy scoreless, made it 2-0 with a header into the net off a corner kick by Sidney Peña. Jones scored near the end of the match after dribbling through the Crusaders defense and firing into the bottom left corner. Senior Caitlin Carcione made it a special Senior Day with a pair of goals to lead the Gators (8-5-6, 3-4-3) past TKA. Junior Sasha Bellack and freshman Ellie Brew recorded the assists. Sophomore Juliana Rosen also scored, with an assist from junior Nikki Molumphy. In addition to Carcione, seniors Caitlyn Perkocha, Ingrid Corrigan, Kristine Fischer-Colbrie and Amaia Minkowski were also honored. In the Skyline Division, Castilleja finished with wins in five of its last six games to place second behind Crystal Springs Uplands. The Gators (11-6, 10-2) made sure to send their lone senior Kate Sands off on the right note with a 2-1 victory over Harker at El Camino Park. It’s a team on the rise as the Gators list a mere four upperclassmen on their roster.